FREE SHIPPING on Orders over $150 for US Residents. Tamegroute is a village located in the Draa River valley in southern Morocco., just before the immense Sahara. In the Berber language, Tamegroute means ‘last place before the desert’. 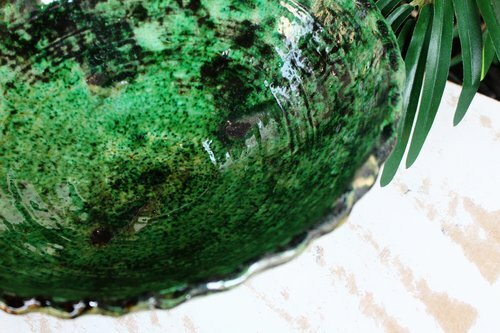 The color and texture is a result of the particular alchemy created by the potters of Tamegroute and remains a family affair handed down through the generations as each pottery piece is completely unique and no two are ever the same. Tamegroute pottery are true showpieces showing that even imperfect can be perfect. 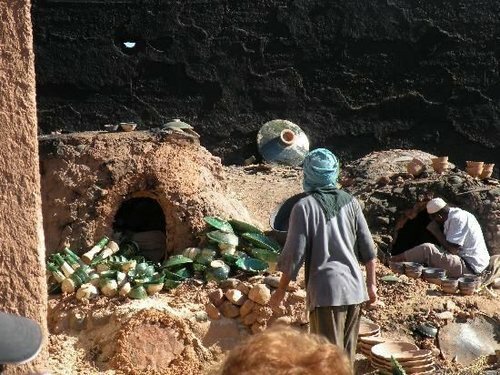 Please note that the traditional method in which the plates are fired involves stacking which result in tiny ‘scars’ in the glaze making each plate unique. Wabi-Sabi – Discoving the beauty in the imperfect. 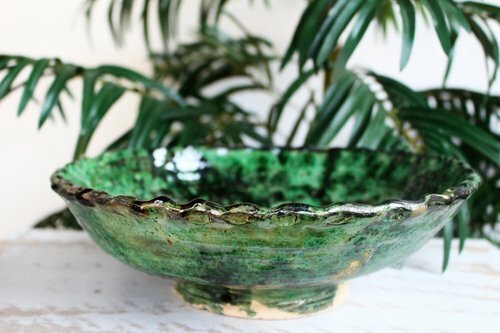 Tamegroute is a village in the south of Morocco, known for the characteristic green pottery. **Please Note: Due to the handmade nature of our products, variations in design, size, and color may occur. We accept payment in the form of MasterCard, Visa, Discover, American Express and Paypal. All domestic orders are shipped USP and do require SIGNATURE for all items upon delivery. If you need a rug to get to you faster than ground shipping please email us at hello@SoukandSoul.com and we will get you a custom shipping quote. All orders are shipped within 5-7 business days from the time the payment and shipping information is received. Once the order is shipped, you will receive an email confirmation with the tracking number. After the package is delivered to your door step, Souk & Soul is not responsible to what happens to it from that point forward. If you would like to set up signature confirmation, you may do that yourself after you receive the tracking information. 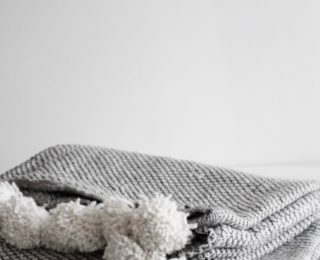 These beautiful handmade Moroccan pom pom blanket are perfect addition to your home accessories. Hand woven in Morocco, this blanket is made from 100% cotton. - measures (114"in x 70"in) -Material : 100% Cotton - Made 100% By hand -Uses : As a bedspread or luxuriously draped over a sofa. -Care : Washable Preferable Dry Clean, Hand-wash and use a detergent for wool. 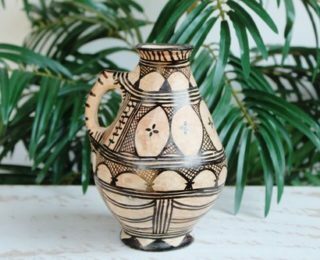 The Pottery industry is one of the oldest richest of Moroccan handicraft traditions as pottery decoration can take many shapes forms . 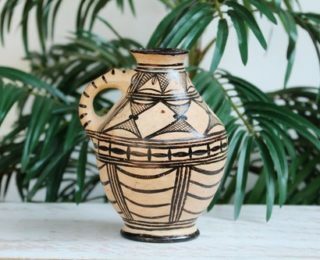 This item use to be as a Milk or water Vase for homes and while traveling in the desert. Wabi-Sabi - Discoving the beauty in the imperfect. 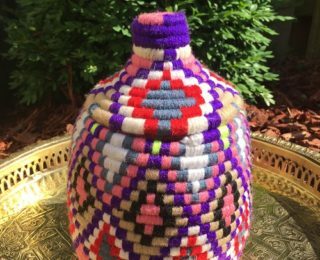 These beautiful handmade Moroccan pom pom blanket are perfect addition to your home accessories. Hand woven in Morocco, this blanket is made from 100% cotton. - measures (112"in x 72"in) -Material : 100% Cotton - Made 100% By hand -Uses : As a bedspread or luxuriously draped over a sofa. -Care : Washable Preferable Dry Clean, Hand-wash and use a detergent for wool. These beautiful handmade Moroccan pom pom blanket are perfect soft wool and make a great addition to your home. 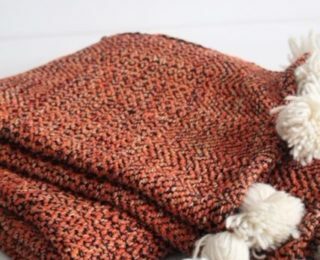 Hand woven in Morocco, this blanket is made from 100% wool. 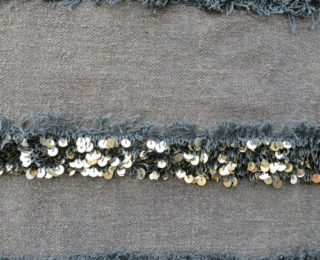 - measures (94"in x 58"in) -Material : 100% Wool - Made 100% By hand - Uses : As a bedspread or luxuriously draped over a sofa. - Care : Washable Preferable Dry Clean, Hand-wash and use a detergent for wool. Dimensions: 6'6" x 3'9" PLEASE NOTE: Please note these are handmade Vintage textiles and all vintage items have a unique history and character, so some may have slight wear and imperfections in weaving, pattern, or shape. We do try to have all rugs repaired before shipping, but keep in mind some imperfections preserve the character and integrity of the piece. 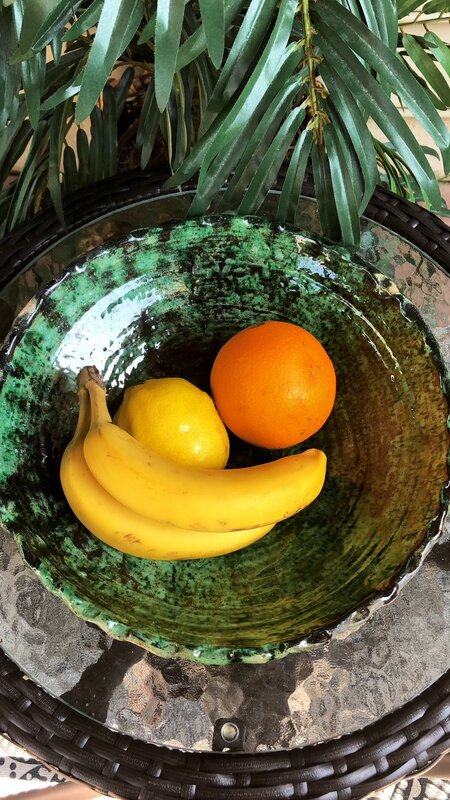 Traditionally designed to store bread these handcrafted Berber baskets will add a touch of color and pattern to any space of a room. 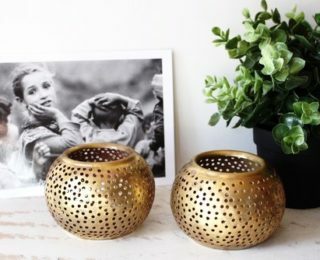 Each piece is handwoven by the Berber tribes in Morocco. These baskets are truly unique works of art. 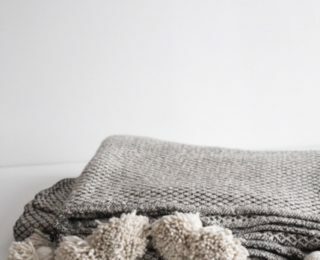 These beautiful handmade Moroccan pom pom blanket are a soft wool and make a perfect addition to your home. 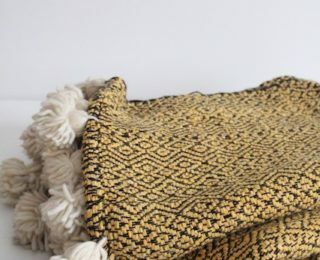 Hand woven in Morocco, this blanket is made from 100% wool. - measures (95"in x 59"in) -Material : 100% wool - Made 100% By hand - Uses : As a bedspread or luxuriously draped over a sofa. - Care : Washable Preferable Dry Clean, Hand-wash and use a detergent for wool. Note: Clutch Includes a removable strap. 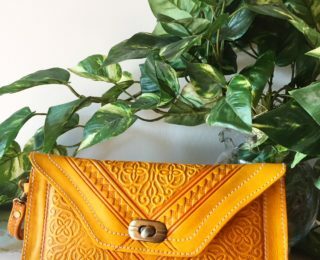 Based between Washington DC and Morocco Souk & Soul is a brand built around the love for travel and culture by bringing a curated collection of handcrafted home decor, accessories, and fashion by the artisans of Morocco. Copyright © Souk & Soul 2018 All Rights Reserved. Be the first to know about new about new arrivals, promotions, and special discount codes.